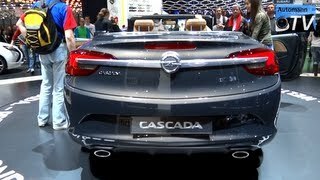 Opel has launched the Turbocharged version of the Opel Cascada which is now more stronger, more attractive and more modern. This powerhouse Cascada is available for an entry-level price of 29,490 euros in Germany. The new body colors underscore the Cascada’s powerful, elegant appearance. Customers can now choose from sophisticated pearlescent Emerald Green lacquer or the double-layer metallic Magnetic Silver paint. In addition, the premium soft-top can now be ordered in light Khaki Grey. Inside the cabin it offers the state-of-the-art, very user-friendly and fast IntelliLink infotainment system which comes with a seven-inch high-res touchscreen display and an optional rearview camera. 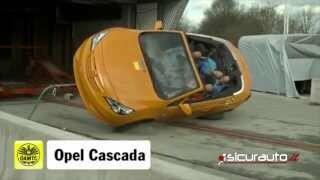 The 2014 Opel Cascada Turbo is powered by the 1.6-liter ECOTEC turbocharged engine with direct injection that develops 200 HP (147 kW) and 300 Nm (221 lb-ft) of torque which is enough to grant the mid-size convertible with a top speed of 146 mph (235 km/h). 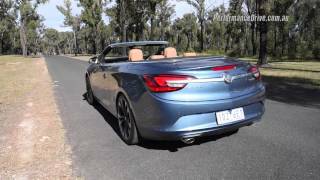 The Cascada features exemplary elasticity, accelerating from 80 to 120 km/h in just 9.2 seconds in fifth gear. It will have a fuel consumption of 6.7 liters / 100 km (35.1 mpg US or 42.1 mpg UK) with corresponding CO2 emissions of 158 g/km.